I arrived at Bruno Rocca in the afternoon for a tasting. Elena Oberto met me outside where they were in the process of bringing in some Barbera grapes. She led me up to the tasting room and showed me the line up of wines that she had set up for me. After I asked some questions about the different sub-zones, she took me back out onto the terrace and laid out a map of Piemonte to help me get a better understanding of the lay of the land. 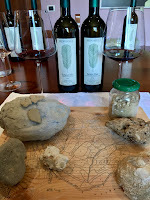 That was just the beginning of what turned out to be an exceptional terroir tutorial. Piemonte is located at the foot of the Alps bordering both France and Switzerland. Within the greater area, there are 59 different production regions making wines from about a dozen grapes in many different styles. The red Nebbiolo wines from Barolo and Barbaresco are the king and the queen of the area. 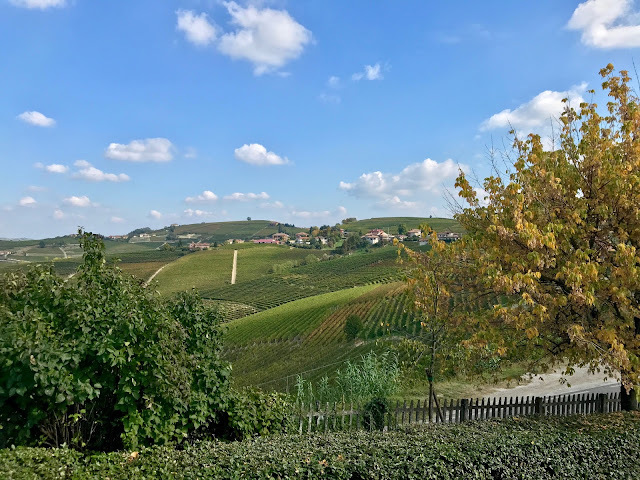 Langhe is a sub-zone lying south of the capital city of Alba on the right side of the Tanaro River. 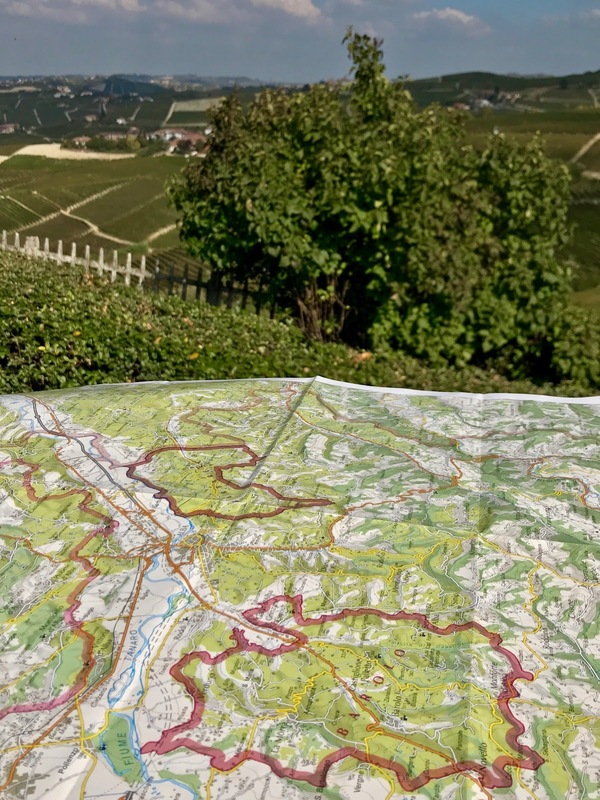 Inside this larger area, lie the production zones for these two premium wines. 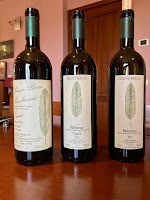 Barbaresco is much smaller than Barolo and has a smaller production as well. We went back inside and started the tasting. I was surprised to see their white of choice as the region has a few native white varieties. Elena explained that Bruno had obtained a small plot of Chardonnay as part of a package deal when he purchased a Barbera vineyard in Nieve. Originally, he considered selling the grapes to another producer but then he decided there would be benefits in having a white wine in his line, particularly to use with paired dinners. He has been producing it since the 1990's and it is now an integral part of the line. Originally, he treated it more like a red wine using 100% oak but now only 20% of the wine spends time in French Oak barrels. Bruno Rocca Cadet Chardonnay Langhe 2016 - Fresh, fruity, and crisp with classic apple and citrus aromas and flavors and a lingering mineral finish. 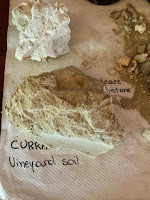 From our vantage point on the terrace, we were not able to see the Barbera growing areas but Elena did show me examples of the different types of soil that their Barbera is grown on in Alba and Asti. Both of these wines were fermented in stainless steel and spent 12 months aging in French Oak barriques. Bruno Rocca Barbera d'Asti 2016 - Fresh and fruity with bright red cherry fruit and a crisp, food friendly acidity with a mineral-laced finish. This wine came from the village of Vaglio Serra where the vines grow in soils composed of limestone, sand, and red clay. Bruno Rocca Barbera d'Alba 2016 - Spicier and slightly rounder with a similar freshness but with a red plum character and a white pepper finish. This wine was sourced from the village of Nieve from older vines growing on limestone and blue marl. Bruno Rocca Barbaresco 2015 - This Classico wine was elegant with floral aromas and a surprisingly approachable fruit-filled finish. 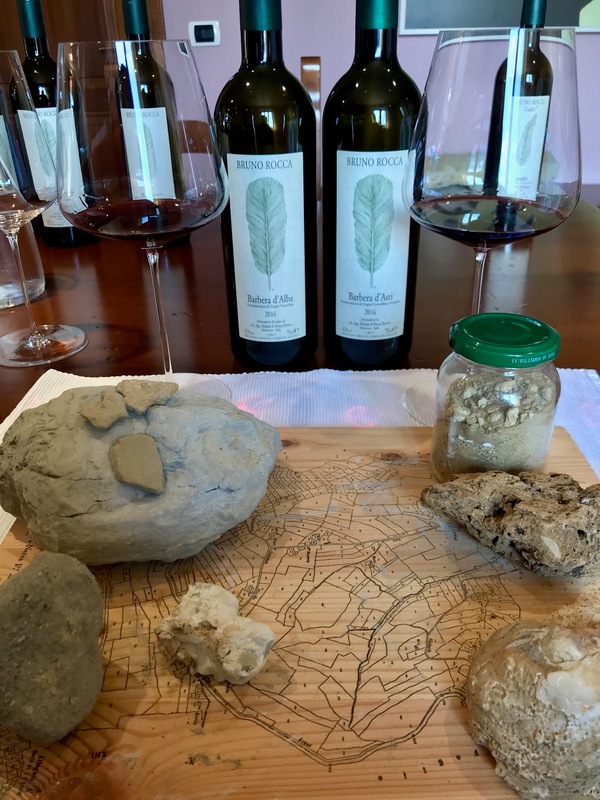 The grapes came from three vineyards in Neive - Cru San Cristoforo, Marcorino, and Fausoni which have clay soils with sandy veins running through them. The wine was vinified in stainless steel and aged 18 months in French Oak barriques before bottling. Bruno Rocca Barbaresco Currà 2015 - Softer and also very approachable, yet still very refined with light floral notes of rose with bright red cherry fruit and a fresh, lingering mineral finish. This wine hails from the Cru Currà vineyard in the village of Neive where the soils are calcareous with Sant'Agata marl and sandstone chips. It was fermented in stainless steel and spent 12 months in French Oak barriques and 12 months in large French Oak barrels. Bruno Rocca Barbaresco Currà Reserve 2013 - This wine exhibited more intense rose floral notes and had a spicy, black fruit character with a bit of licorice in the persistent finish. It came from the same vineyard as the previous wine but from a specific block which has shown itself to create wines with greater depth. It was both fermented and then matured for 24-36 months in oak barrels. Elena referred to the "sweetness in the bouquet". Beautiful and elegant, each was a delight to taste and all are recommended. Since I returned to Houston, I have enjoyed one more of their wines. The Bruno Rocca Trifolè Dolcetto d'Alba 2017 which is on the wine list at Coppa Osteria. The grapes for this wine are sourced from the village of Barbaresco. 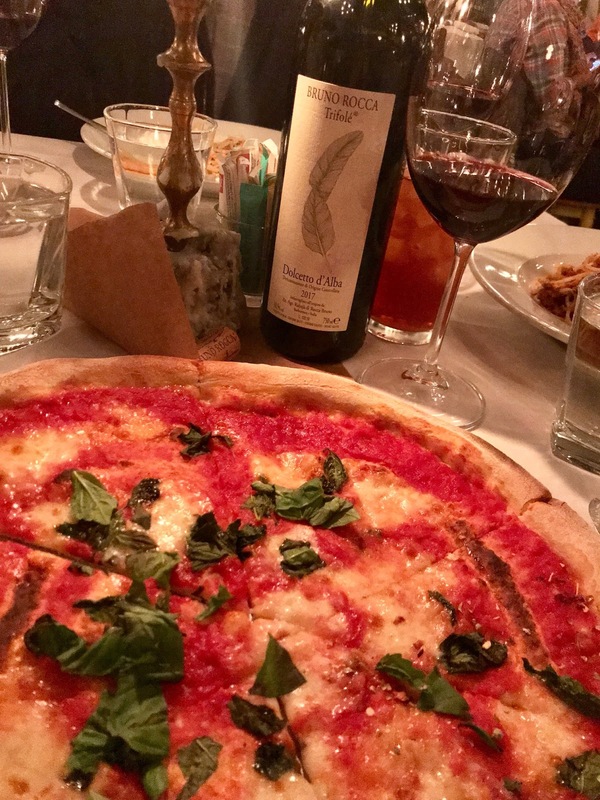 Fruit forward with black cherry aromas and flavors, Dolcetto is considered to be an anytime wine, it was absolutely delicious with our pizza and pastas.